Through public private partnership the Gauteng Department of Health and Chris Hani Baragwanath Academic Hospital (CHBAH) gave recognition to their Motor Neuron Disease (MND) clinic as a center of excellence to intensify its health care services. This is in response to a desperate need to offer special care to patients who are suffering from this debilitating progressive disease, which in many instances ends up paralyzing patients, often described as patients being trapped in their own bodies. Rugby legend, former Springbok scrumhalf Joost van der Westhuizen succumbed to the disease in Febuary 2017. Gauteng’s MEC for Health, Dr Gwen Ramokgopa, highlighted the plight of the largely forgotten sufferers of MND at the event hosted on 6 July and added her admiration for the late Joost’s fight against the disease and his efforts to raise public awareness, particularly those from disadvantaged and resource constrained patients. “Patients now have regular access to therapy across a range of disciplines, including medical care, physiotherapy, occupational therapy, speech therapy and social workers,” said MEC Ramokgopa. 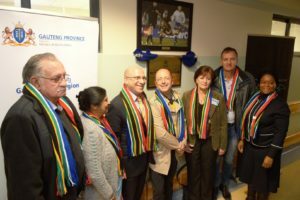 The Clinic is a joint collaboration between a number of stakeholders, including the Provincial Department of Health, Chris Hani Baragwanath Academic Hospital, Wits University Medical School, The Joost van der Westhuizen Neurodegeneration Foundation (JCN), Aspen and various Patient Support Groupings. “While MND is a poorly understood condition and one that requires significant further effort, there are a number of practical steps that can be taken to materially improve the quality of life of patients, particularly those that are resource constrained. This initiative will make a significant difference to those patients. Although Aspen is not directly involved in the MND therapeutic area, it has a number of neuroscience products, which offer a broad range of therapeutic solutions and this initiative is supportive of Aspen’s neuroscientific presence,” added Stavros. With the assistance of Aspen, the team will work towards improving access to care for MND patients, furthering South African research efforts and building relationships with international researchers with a view to establishing clinical trials in South Africa. It’s a bold step towards the end goal of creating a world-class centre of excellence housed in its own building and dedicated to the care, research and well-being of MND patients.